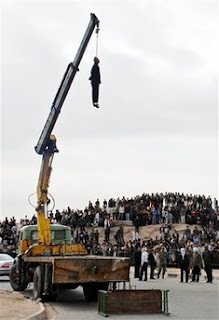 It took Iran less than a week to hang the man who supposedly was behind the bomb blasts last week in Zahedan. The public spectacle was aired on national TV. The Iranian News today blamed the US, Britain and, of course, the Zionist regime for being behind the the unrest in various areas of Iran including Khuzestan, Kurdestan and Azarbaijan provinces. The hanging took place in front of a public gathering at the same location of the blast. Iran hanged in public Monday a man who had allegedly confessed to involvement in last week’s bomb attack that killed 11 elite Revolutionary Guards, televising recorded footage of the convict’s execution. Nosrallah Shanbeh-Zehi had been found guilty by a revolutionary court of participating in Wednesday’s bombing in the restive southeastern border province of Sistan-Baluchestan, the state-run IRNA news agency reported. In a highly unusual move, state television aired recorded footage in its lunchtime news bulletin of the execution in front of hundreds of cheering residents at the scene of the attack in the provincial capital of Zahedan. The pictures showed the rope — attached to a crane — being placed around the man’s neck by a group of executioners, whose faces were covered by hoods. His death drew clenched fists and shouts of joy from the crowd. Shanbeh-Zehi had already been screened on local television a day after the bombing allegedly confessing to involvement in the blast and working with the Jundallah Sunni militant group. Iran blamed the US and the UK for being behind the recent terror attacks in the southern Iranian region. The LA Times is finally carrying a story about the weapons that the Iranian regime claims are supposedly from the US and UK. But, Charles Johnson notes that there is something strange about the grenades in the Iranian report. Iran Produces “Evidence” That US Was Behind Zahedan Blasts!